A Buddhist is someone who follows the teachings of the Buddha and tries to incorporate them into their daily lives. Buddhists are everyday people. They work, have families and experience the same ups and downs of everyday life as anyone else. Like many people, they have good qualities and bad qualities. They may not be perfect, but what they have decided to do, however, is to strive to do better. This means they try to bring more compassion and loving-kindness into their relationships with others. They try to eradicate tendencies towards greed and hatred in their lives. They also try to follow the moral guidelines laid down by the Buddha. Some Buddhists become monks and nuns, devoting every aspect of their lives to following the Buddha’s teachings. Those who have decided upon this path lead celibate lives and usually join a monastic community. The majority of Buddhists, however, are lay Buddhists. There are formal and informal ways of becoming a Buddhist. Deciding to commit oneself to following the Buddha’s teachings by taking refuge in the Buddha, Dhamma and Sangha is to become a Buddhist. No formal ceremony is necessary. 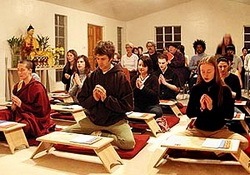 The emphasis in Buddhism is to practice the teachings rather than to engage in ceremony in ritual. However, most people will recite a formula where he will commit to “take refuge in the Three Jewels“, which are the Buddha, the Dhamma which are his teachings and the Sangha, the community of holy disciples. This ceremony was practised since the time of the Buddha himself and has continued down to us as a noble tradition. What moral rules do Buddhists follow? The Buddha gave his lay followers five rules or precepts to help them live good moral lives. He advised them to abstain from harming livings beings, from taking what is not given, from sexual misconduct, from false speech, and from intoxicants such as alcohol and recreational drugs. Monks and nuns follow further precepts which prescribes rules for many parts of their lives. What particular practices do Buddhists engage in? Buddhist practice is described in the Noble Eightfold Path. Different communities and traditions place varying emphasis on various sections of the path. 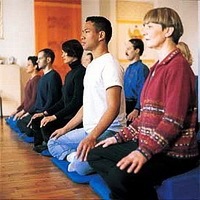 Most schools of Buddhism place great emphasis on meditation, of which there are several methods. Other schools place emphasis on the recitation of sutras and mantras (the repetition of syllables, words or phrases). Which methods are practiced depends on the individual, some methods suit certain personalities better than others. All Buddhists value active participating in a community of like minded people, encouraging each other along the path and supporting the monastic community. No. Buddhists practise the Five Precepts and the first precept is to abstain from harming or killing living beings. Many Buddhists are vegetarians but the Buddha did not prohibit the eating of meat. However, many Buddhists are moved by compassion to reduce or to stop eating meat altogether.